.Picture a large, noisy, crowded health club. Now picture the exact opposite of that. 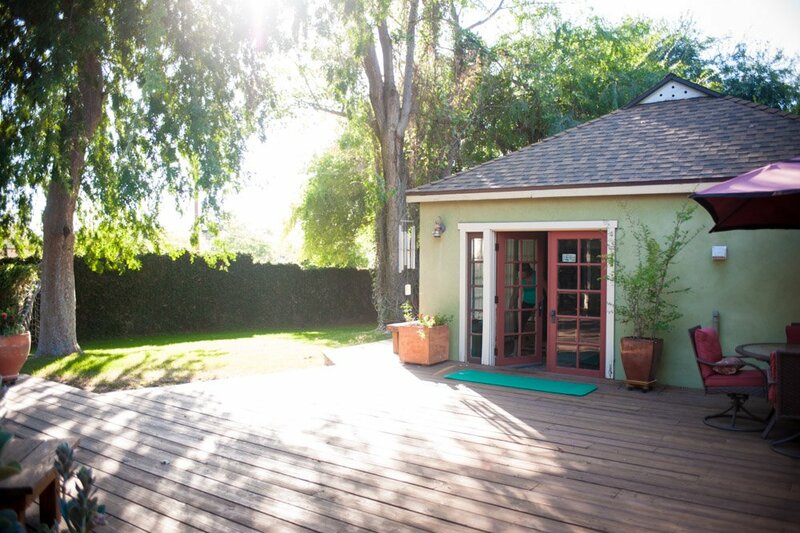 That’s my studio—a calm, healthy oasis in Altadena. Located in a quiet residential neighborhood, my 400-square foot studio is surrounded by a 650-square foot deck and a mature shade tree. The fragrance of jasmine and orange blossom and the soft ringing of the chimes adds to the picture-perfect setting. The studio is equipped with the Reformer, Cadillac, Wunda Chair, Ped o Pull, Foot Corrector, Spine Corrector and mats, along with room for one to four students for a mat class. The deck can hold 15 students for a mat class and even more for lectures and demonstrations. Students love “Pilates on Deck” and have organized classes for groups of friends and coworkers. I've even taught a Mom & Me class. My studio deck is the perfect venue for classes as well as half-day and full-day retreats. The studio is also available for rental by film production companies. To make sure you know about all the special events at my studio, add yourself to my email list. Your email address will not be shared and you may unsubscribe at any time. WEBSITE CREDITS Photography (except "Pilates on Deck") by Rebecca Little Photography. ​Content editing and Weebly wrangling by Paula L. Johnson.